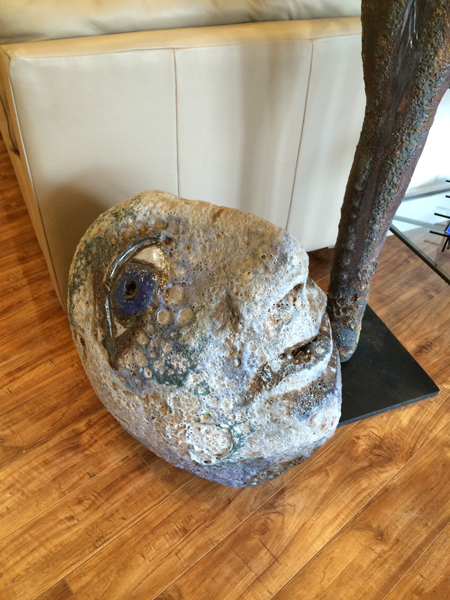 Have you seen our sculptural work by Mark Chatterley? 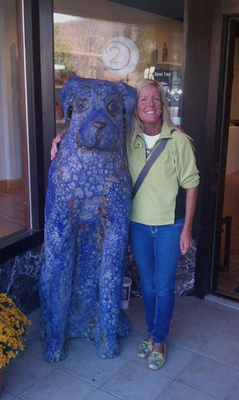 Big Blue, named “Vincent van Chatterley” by one of our customers has been outside our front door through ArtWalk and ArtPrize. 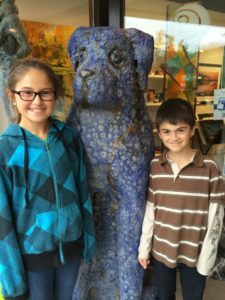 Daily we have visitors stopping to take pictures with “Vince” and their spouse, friends, and kids. So much fun to watch. Mark’s big dogs and pups receive a lot of attention. Everyone seems to relate to his dogs. When considering these ceramic sculptural figures, you wonder what was the artist thinking when creating them? Did it just evolve while being built? Was a certain idea or mood desired when looking at the form? Are Mark’s forms literal? What do they mean? What do you think about when looking at his human figures? 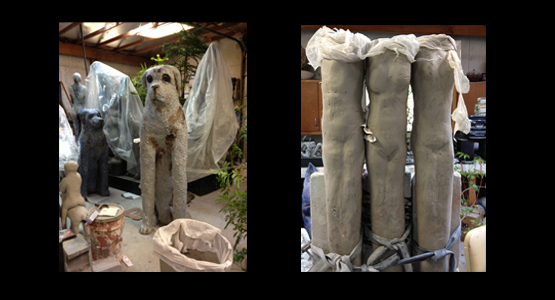 I visited Mark Chatterley’s studio two years ago. 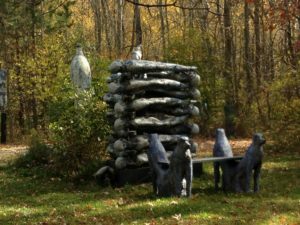 I learned about his process, saw his studio and kiln. Wow! Can you imagine working throughout the week on your projects, living with these beings?…… I find it fascinating thinking about Mark’s process and sculptural work. Mark’s artist statement helps us have a better look into what he is thinking when starting a new sculpture. “Everything is either moving toward or away from nothingness. Life, death, creation and destruction this is the world I find myself in. My daughter, Camille, was here this weekend. She had a couple of minutes to look at each of our ArtWalk artist’s entries. Her comments are always interesting to me. Camille’s opinions are always thoughtful. She read each artist statement, looks again at the work, and usually provides a very interesting perspective. Stop in to see what you think or even fall in love with one of the sculptures. Take one home or display in your office. 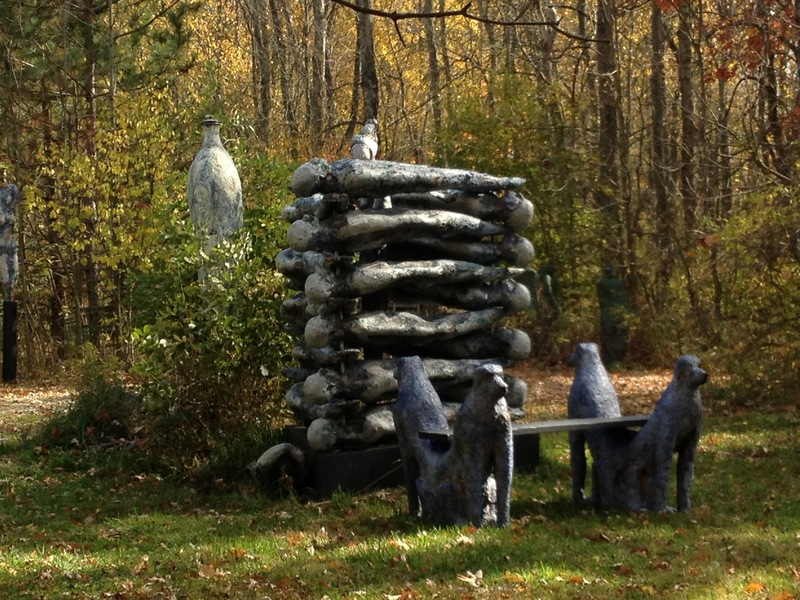 Most of Mark’s work can withstand our Michigan winters. 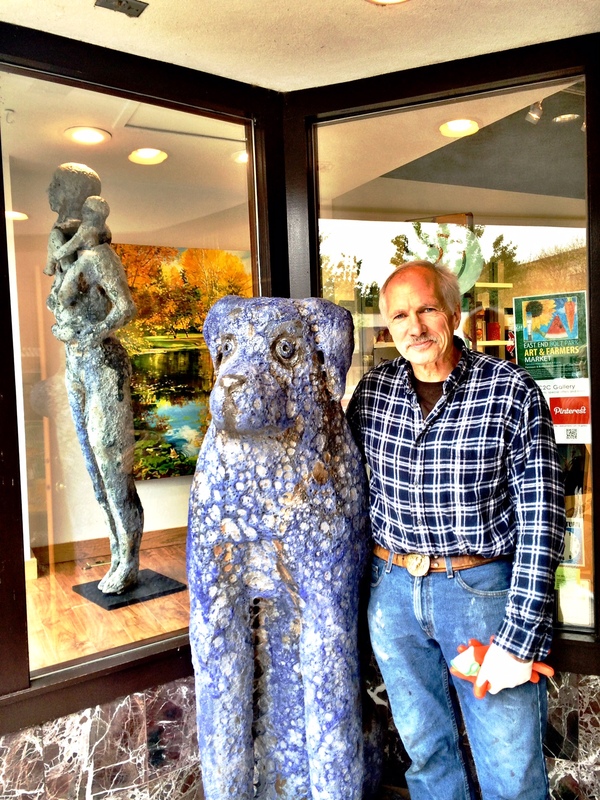 Mark has more than 30 years experience in Figurative Sculpture. He is nationally and internationally recognized. I have been thrilled to exhibit this ceramic artwork in the gallery and at the Grand Haven Community Center. The larger forms will be in Grand Haven until October 22.